On the 5th of April, when the New Moon rises, we will start to explore the relationship between witchcraft, anti-capitalism and feminism! 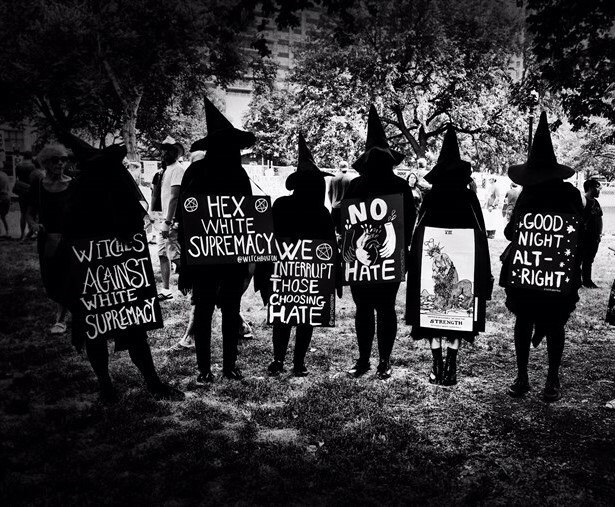 Women* who have opposed capitalism, patriarchy and Christian power structures have often been labelled as witches, with the result that many have been tortured, hanged, burned or killed in other terrible ways. The genocide of women during the early modern witch-hunt era in Europe is often overlooked when we talk of periods in history that have had an impact on social inequalities in contemporary society. Yet, these witch-hunts occurred during the rise of modern day capitalism, and when the political and economic power of the church became very important. Christianity and capitalism sailed together to other places and there too, decided that powerful women*, medicine women*, shamans and everyone who they saw as ‘witches’ were destroyed. Together capitalism and Christianity survive and become stronger through patriarchal power structures – let’s hex them and destroy them! We will dive into the history of the witchhunts and its connection to capitalism with the help of Silvia Federici’s research. We will especially focus on ‘Witches, Witch-hunting and Women’. She will offer us an explanation of how anti-capitalism should be connected with feminism, and the other way around. Time and date of the reading group: 5th of April, 19h. Address: Roggeveenstraat 56, The Hague.